View north from Horgabost on Harris. During May andï¿½ June 2010 we travelled for two weeks from our home in Cheshire up into Scotland and across the sea to the Outer Hebrides for a wonderful 2 weeks holiday. 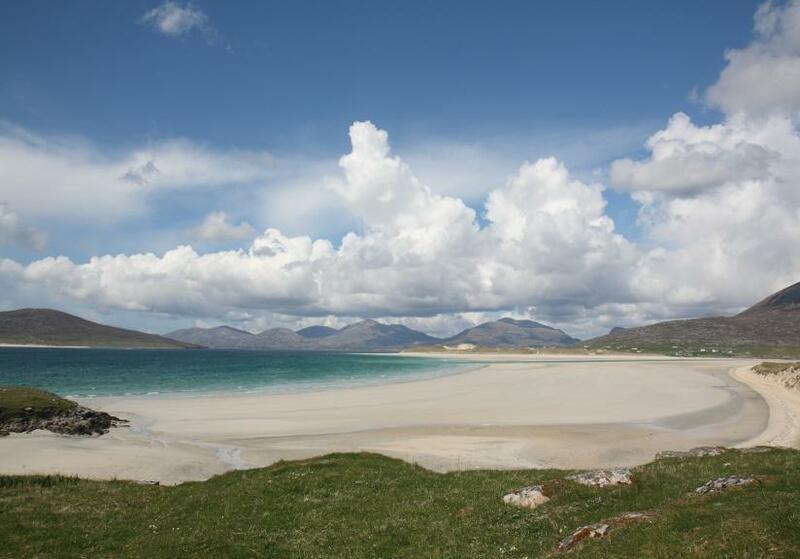 We sailed form Ullerpoolï¿½ in north west Scotland to Lewis then to Uig and on to Harris. Then sailed to Benerayï¿½ onto Northï¿½ Usit , Benbecular, South Uist and Ereksay. We the sailed to Barra and visited Vatersay before sailing the 5 hours to Oban. We will try to give a feel for the place as well as as much information to help anyone who would like to go there. We will go again soon as we both loved the place and its people. This site is only for information and help with planning a visit. So with a car 2 tents one large for the campsites in the north that exist and a small tent for the south where they donï¿½t and no showers as well but thatï¿½s a story for later on in the tale see info on Barra about campsiteï¿½s. See our new travel site in Gladys on tour around Europe.